We Americans are still in the process of embracing the concept of benefiting from eating whole grains. Yesterday, I met a lady from Washington State whose husband has diabetes. She reported to me how amazed she was that her husband could eat brown rice, but not white rice, without sending his blood sugar climbing to the big numbers. One of the lessons that I need to take to heart is that just because the research tells us that eating whole grains is far superior to processed grains, doesn’t mean that we will immediately make the switch. I’m patiently continuing to share the message of whole grains, that is, there is a difference and there are valuable benefits. The current Dietary Guidelines for Americans recommends that at least half of grain products come from whole grains. During the next few months the new Dietary Guidelines for Americans will make a stronger recommendation for whole grains than we’ve had during the past 5 years. The number of studies that support eating whole grains has continued to grow. Yet another report has been published in the Archives of Internal Medicine, based upon the results of a Harvard Public Health study; Qi Sun and his colleagues are suggesting that whole grains should be the primary source of carbohydrates, rather than refined grains. 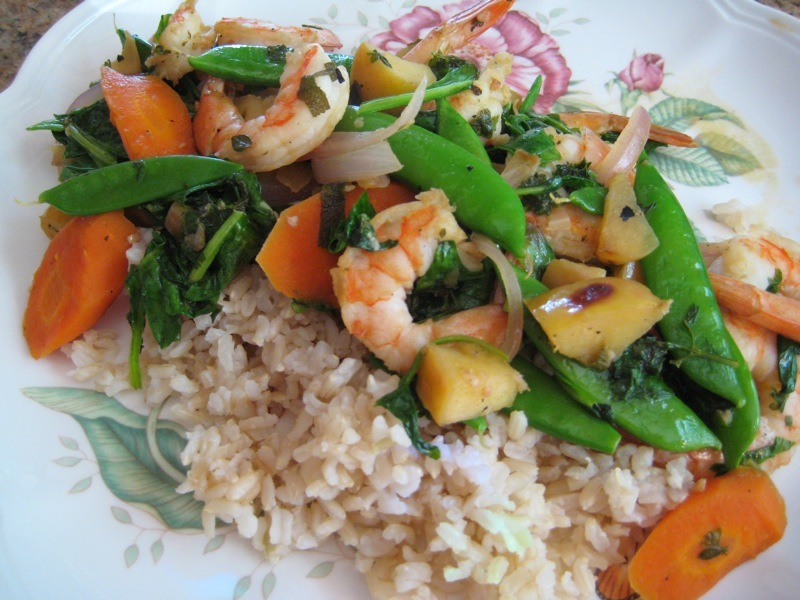 Their study compared brown and white rice consumption and the incidence of type 2 diabetes. The researchers found an increased risk of type 2 diabetes in those that ate white rice and a decreased risk of the disease in those who ate the brown rice. An even greater reduction of risk was found in those that substituted whole wheat and barley. The Harvard School of Public Health study did not identify what aspect of the brown rice caused the protective effect; but noted that brown rice has a higher fiber content, more minerals, vitamins, and phytochemicals (plant nutrients), and often does not generate as large an increase in blood sugar levels after a meal. 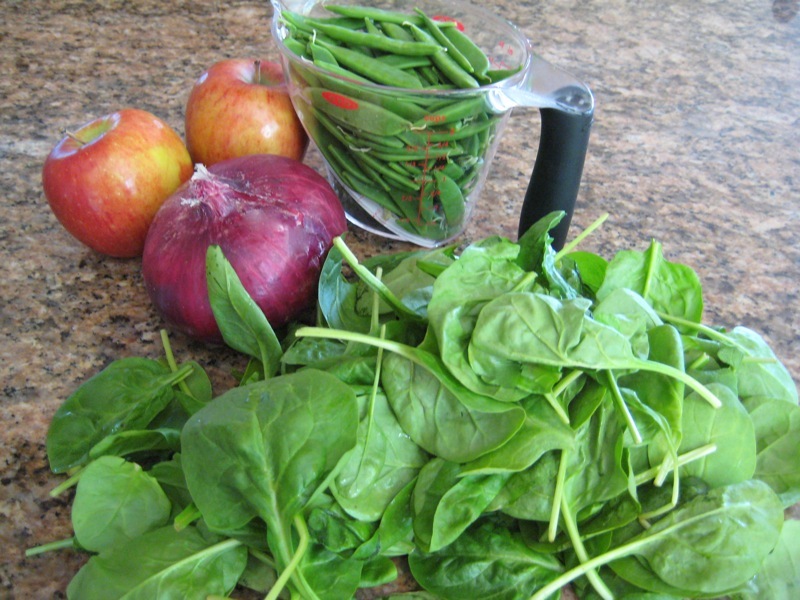 All of these benefits have previously been discussed in this blog, just because we don’t know which nutrient or combination of nutrients cause the positive outcome, shouldn’t be a reason to slow us down from making the decision to eat whole foods. The answer could be a combination of foods or the nutrients in a certain whole food. Now, I must get back to my sober realization that not many people are going to make the commitment to switch regardless of how much research is put before them. Even Dr. Grandpa switched from the white bread he loved to 100% whole wheat bread only over time, after Diabetes, and with the help of extra yumminess. He didn’t like some whole wheat breads but liked it with added sunflower seeds, and loves it when I make a homemade loaf with sunflower seeds and toast it. Also, at parties and eating out he will eat a small portion of especially tasty breads or pastries based on refined white flour. Still, he keeps his blood sugar down without the help of drugs. Whether you’re worried about heart disease, colon cancer, weight management, or diabetes, the evidence continues to grow that it’s time to get off the processed grain train and onto the whole grain train. But take heart, the club car on this train still serves some artisan white breads and pastries, which we can eat in small portion sizes, with slow savoring, but with a strong, determined mind to keep the portion size small and infrequent. The moderation can be managed if we have learned where to find really yummy whole grain products. This is the main fare in the Whole Grain Train’s club car. Your craving is under control when plenty of yummy whole grains and veggies are under your belt. It has been my mission to provide and point to these choices for more and more people. The flavors in this recipe are very pleasant together; we didn’t add salt and enjoyed the flavors, but you may want a dash of salt. This is a little fancier than ordinary peas and carrots with rice. Sage and parsley are two perennial herbs (plant them once and gather year after year) – somewhat quaint to gather them fresh from the garden! 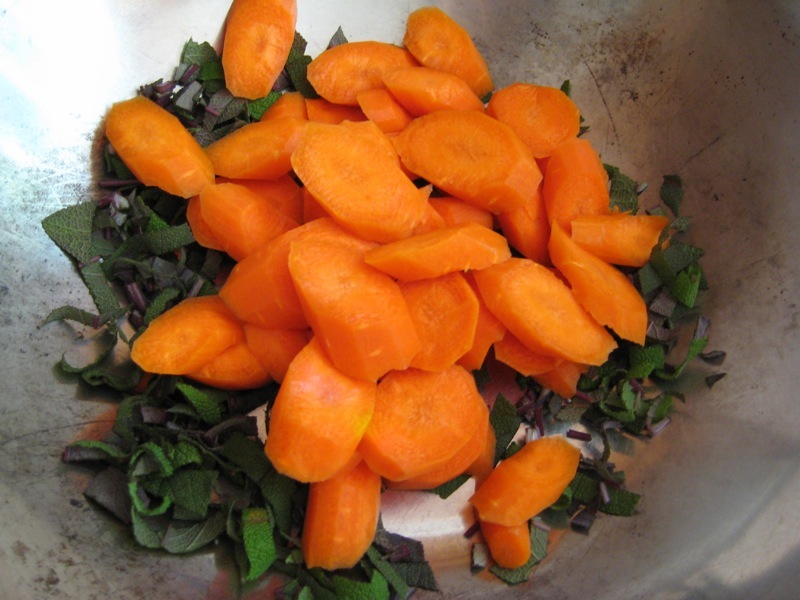 Sauté sage, carrots in the oil, until carrots begin to be tender. 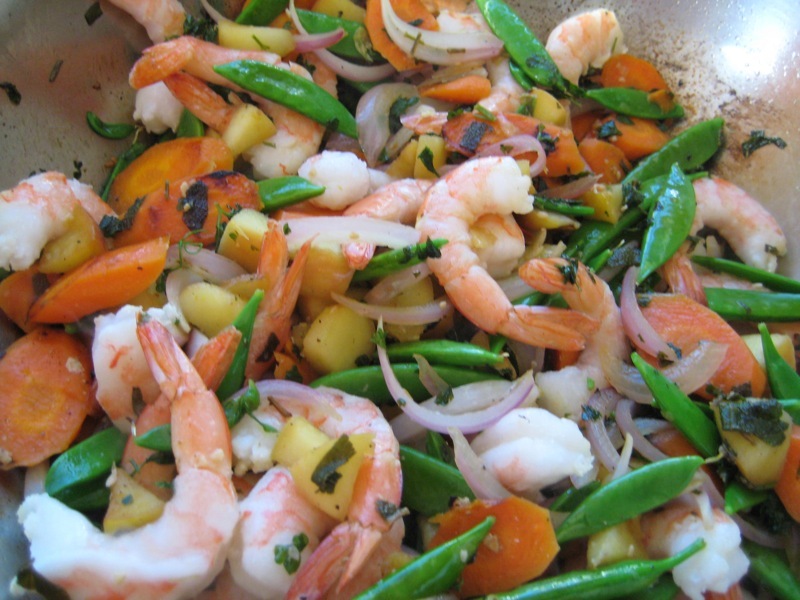 Add the garlic, onion, apple, parsley, pepper, pea pods and shrimp; stir until shrimp become opaque. Add the spinach and stir until wilted. 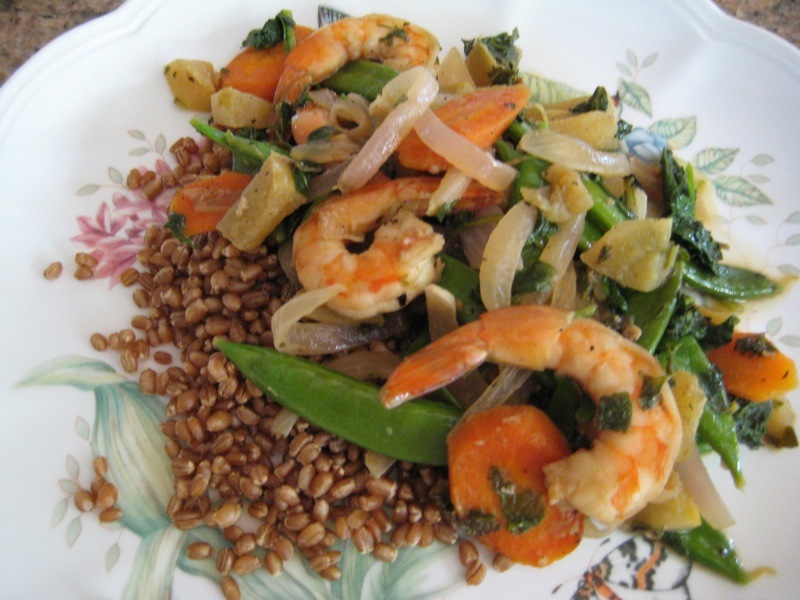 Serve over steamed brown rice or wheat berries. 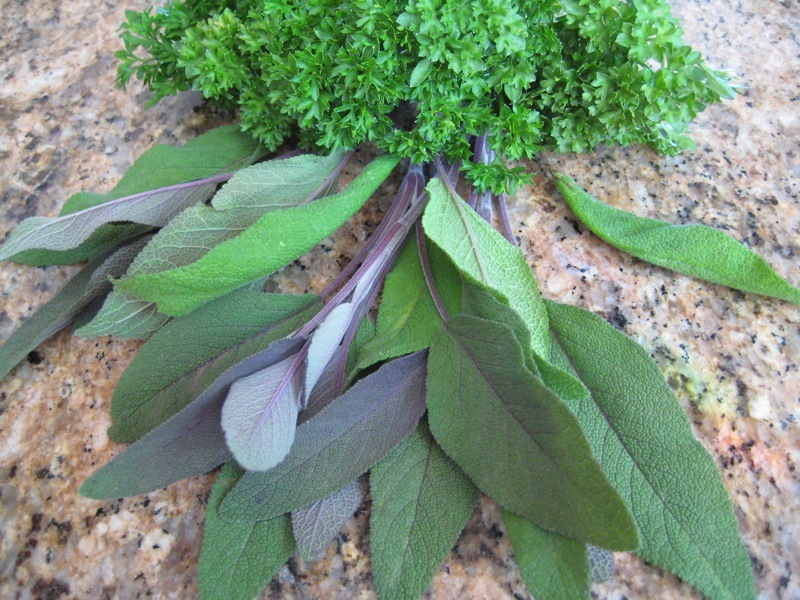 Any sage and parsley will work; but this is my beautiful purple sage and curly parsley. More flavor and color for the recipe. 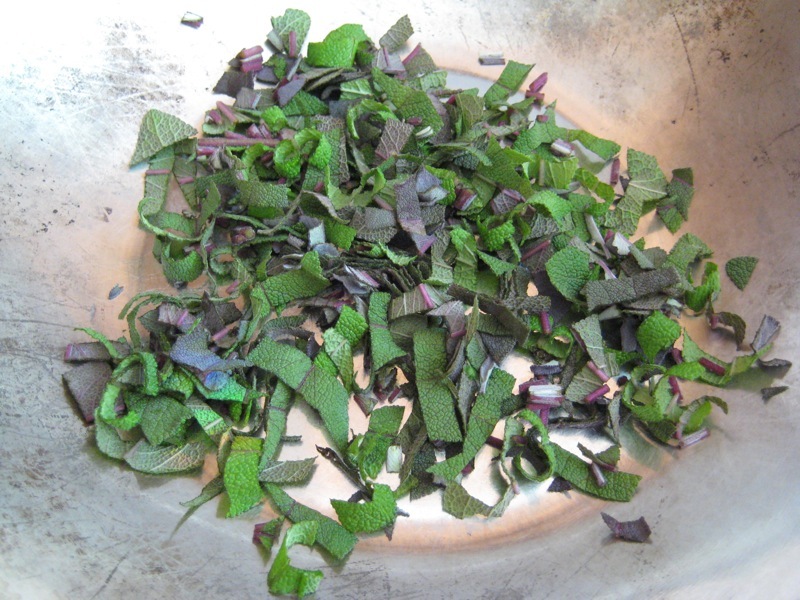 Chopped sage and olive oil. Add the carrots and saute. 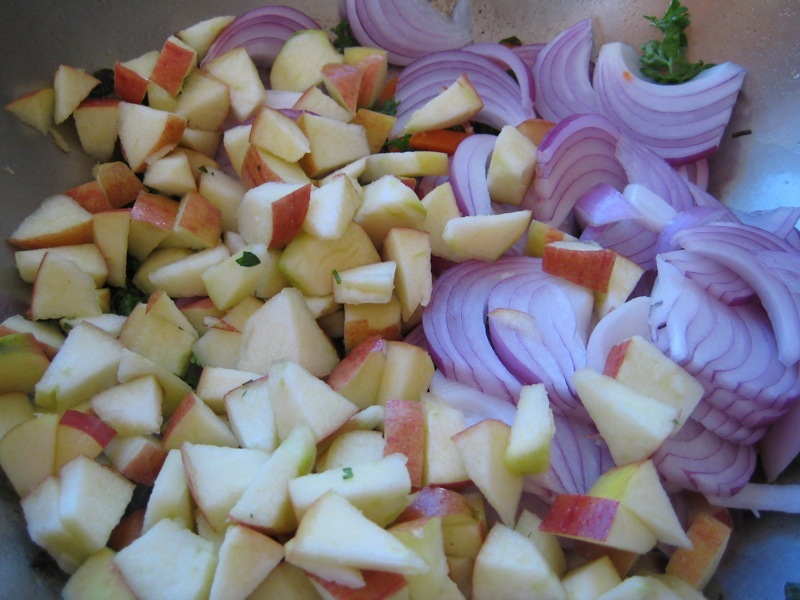 Onions and apples for even more flavor. Finish with the shrimp and then the spinach. Or for a nuttier flavor, serve with wheat berries.